Last week, I attended the London Mozart Players’ concert as part of the Reading on Thames Festival. Musically, the evening was excellent. The LMP were on great form, sizzling their way through some well known classical ‘warhorses’, as leader Ruth Rogers put it. Playing without a conductor, the level of communication between the players was heightened, and although the tempi were sometimes brisker than I’ve known for the works (notably the Elgar and Tchaikovsky serenades), this didn’t make them ‘wrong’ – just different, and pleasingly so. Not everything about the evening pleased me, though. The roaming photographer during the first half was visually distracting, and the sound of the camera clicking at inopportune moments was deeply disappointing (particularly in the tense silence at the end of the Barber Adagio for String). I’ve no doubt he takes great photos, but the audience’s ability to hear the music without distraction must be paramount. For this reason, the sound of glass jugs being clinked on their return to the kitchen adjacent to the hall, during the second half, was also annoying. The concert was generously supported by the High Sheriff of Berkshire. Top classical musicians like the LMP don’t come cheap, and I wonder whether the small ensemble surprised some concert-goers (a dectet of five violins, 2 violas, 2 cellos and a double bass), who may have expected something bigger. The sponsorship enabled the Reading on Thames Festival to keep ticket prices down to a tenner – great value for such hearing such quality playing and, I’m reliably informed, priced to try to make the concert accessible. Very laudable, but I wonder how much having a representative of HM the Queen fund and host the event reinforces the tired old stereotype that classical music is for a privileged elite. The other major cost the High Sheriff would have to bear was the hire of the venue: The Concert Hall within Reading Town Hall. In his opening address, the High Sheriff lauded the hall as ‘One of the best venues for classical music’. As you’ll read below, I don’t necessarily agree with this appraisal, but there’s no doubting that it’s a beautiful room and an auspicious venue. Hearing a concert in there gave rise to the underlying emotion of the evening for me: sadness that after many years of successful concerts there, the Aldworth Philharmonic has been priced out of the hall. APO first played at The Concert Hall in October 2003. We were afforded a special rate by Reading Borough Council, to use the venue at a time of year when it wouldn’t normally get used. From 2005 to 2016, we performed in the hall every January. In each of these concerts, we presented a world premiere of a commissioned work from a young composer (sometimes more than one – as was the case for #APOpictures). Our largest audience was nearly 650, when our President, Wayne Marshall, joined us as soloist for Rhapsody in Blue in 2007 (far larger than the LMP’s ‘sold out’ audience, which only occupied the centre area of the stalls – the balcony was closed and side stalls not put out). A few months ago, I wrote to (and received an encouraging reply from) Hilary Scott of Theatre Arts Reading (TAR), the partnership whose plans for transforming the site of Reading Gaol into a creative hub have been, quite rightly, broadly welcomed by the local community and politicians of various parties. I’m reproducing that email here, because it’s an outlet for my anger at the way Reading Borough Council has actively sought to price out local groups from using The Concert Hall for…concerts! You’ll see what I mean, below. I hope, however, that the email enables me to raise the matter in a somewhat more positive context, by urging TAR to consider the needs of all the arts, not just theatre, to the benefit of the overall plan and its business case. And of course, for me that means making the case for large-scale, unamplified music. The email was sent after an information/media event launching the vision for the site, which can be found here. Annoyingly, I’d arrived an hour too late, in case you’re wondering what I’m on about in the first paragraph! Thank you for the update. As I turned up at the wrong time for the recent meeting (2pm, instead of 1pm! ), I’ve had a look at the project website. Firstly, I echo the remarks made at the final part of the meeting (once I’d turned up! ): this is a fantastic initiative, to be applauded. I hope that my comments below will be taken in that context and not seen as negative in any sense. I am keen to make a positive contribution. Given the emphasis throughout the website and presentations on theatre, I think it’s important for me to lay out the case for music and in doing so, strengthen the case for the project overall. To do this, I need to talk about the status quo for orchestral and choral music in Reading. In anticipation of you forwarding this to the relevant people involved, who might not know me, perhaps I should give some personal context. I am the Music Director of Reading’s Aldworth Philharmonic Orchestra (APO). We are an project-based, amateur orchestra and a registered charity that has given over 50 concerts in our short 16-year existence. 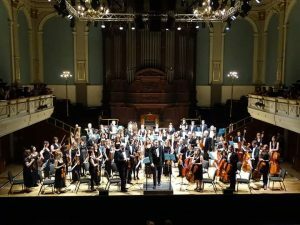 We give 3 or 4 concerts per season, as well as putting on other events, such as our very successful ‘Route to the River – Schumann at the Station’, which has seen us shortlisted in two categories at this year’s Reading Cultural Awards, including ‘Cultural Organisation of the Year’ [we subsequently won the ‘Performance of the Year’ category!]. APO is one of many orchestral and choral societies in the local area. Reading and Henley Symphony Orchestras (amateur) and West Forest Sinfonia (semi-pro) regularly perform concerts in Reading, not forgetting my alma mater, Reading Youth Orchestra, and the former Berkshire Young Musicians’ Trust (now known as Berkshire Maestros) and Music at Reading [University]. Amongst the many choirs are Tamesis Chamber Choir, Reading Bach Choir, Reading Phoenix Choir, Thames Voyces, Reading Festival Chorus, Thames Valley Gay Chorus. I’m only scratching the surface with this list. A big problem for the orchestras is the lack of a configurable venue of sufficient size, with good acoustics and facilities for the audience. For large concerts, we often need space for 80-90 players, complete with a large array of percussion, with players towards the back of the orchestra raised to increasing levels, both so that sound carries over the strings and for the audience to be able to see all the players in action. Our largest forces to date numbered nearly 150 players and singers for Mahler’s Second Symphony, and we shall once again squeeze onto the extended staging at the UoR Great Hall in October, for Mahler’s Third. 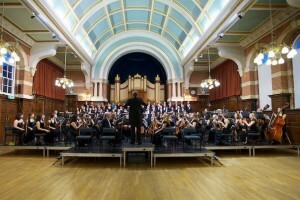 The Concert Hall (Reading Town Hall) – the original stage is too small for anything bigger than a chamber orchestra. 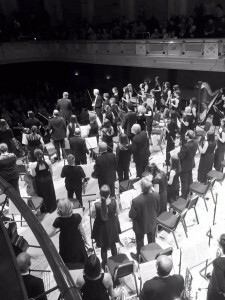 We have to pay to have the staging extended, and even then it is an awkward size and not configurable, due to the nature of such a historic venue (we used to be able to use ‘SECO’ staging, but this was so awkward and time-consuming to set up that the technical team say we cannot now use it – this means the orchestra is all on one level, rather than the wind, brass and percussion being elevated). Once you increase the forces beyond chamber size, the acoustic becomes awkward. It’s too boomy for large orchestral works and the sound can become distorted. The air conditioning is very loud and turning it off makes the venue unbearably hot. The front-of-house staff are poorly trained (letting people in during quiet passages in the middle of pieces, with the ancient doors squeaking for the want of some WD40!). The seating throughout is uncomfortable and has a terrible view – particularly upstairs, where many of the seats only allow for a partial view of the stage. Despite this, it’s an auspicious venue – a wonderful sight (if not quite such a wonderful sound). But by far the most limiting factor in recent times is the business model that has been adopted by Reading Borough Council for the venue. Prices have shot up, to the extent where it is now unaffordable for us to perform in there, even on the ‘charity’ rate. The fairly brazen policy has been to price out arts events in favour of corporate conference bookings and wedding receptions, which bring in more money. We understand that RBC is strapped for cash and don’t complain about getting zero subsidy for our activities. However, as a local charity, we do object to RBC making money from us (i.e. us subsidising the council – which is a bit galling being a council tax payer), rather than providing us with a venue at cost price – a particular shame, as the venue sits empty most evenings. Imagine if local swimming clubs had to pay equivalent prices for using swimming pools, or football clubs to use council pitches. There’d be an outcry. The point here is that using the new venues (and that includes the larger one, once in a while), needs to be affordable to local groups. I’m sure that this will be factored into TAR’s plans. The Great Hall, University of Reading (London Road Campus) – this is the most feasible venue for large works. It has a pleasingly resonant acoustic, but with little reverb. The original stage is too small by far, so we have to hire in extra staging at some considerable cost (bearing in mind the hire cost, though better than The Concert Hall, is not inexpensive), so that the audience has a chance of seeing and hearing the strings. The seating for the audience is small, rigid and uncomfortable, and the venue is quite a way out of the town centre (though it does benefit from having parking on site). The foyer and backstage facilities are small and tired. The Hexagon – not only the most expensive of the lot, but quite simply the worst acoustic for unamplified music currently used as a major venue, that I know of. Orchestral, choral and operatic sound goes there to die. Reading’s classical season has been slimmed down in recent years, with fewer and fewer concerts. We are lucky to have the Royal Philharmonic Orchestra coming to perform in it, still (I think it would be very useful for TAR to consult with them, by the way). Why the decline in classical audiences? Partly, I’m sure, because why would music-lovers want hear a great orchestra in Reading at a horrible venue when you can hop on a train and be in London or Basingstoke fairly quickly? To attract world-class orchestras, choirs and opera companies back to Reading, and to persuade audiences to stay here, both venues in the plan need to have flexible acoustics that can be adjusted for different uses (more direct sound for theatre; more resonance and reverb for unamplified music). This should be possible with modern acoustic engineering practices. Surfaces can be interchanged to provide or damp reflective sound. Acoustic voids can be integrated into the design, the entrances to which can be opened and closed to increase or decrease reverberation (this has been common practice for many years – see examples at Symphony Hall in Birmingham and the Southbank Centre in London, following its refurbishment). Both venues need to be ‘big’ enough to accommodate the full sound of a large ensemble – this usually means a good deal of height to the room (which also aids reverb). Both venues also need to be highly configurable, not just for theatre, but for unamplified music, too. By this, I don’t just mean the acoustic: I mean flexibility of staging to allow for different set ups, with risers that can easily be shifted around to change levels of staging, or stage lifts. And I assume that the seating will be raked, to ensure there is not a bad seat in the house? It’s difficult to accommodate everyone’s needs, but if we can get as close as possible, there’s no reason why there shouldn’t be something on in both venues every night of the week. My final recommendation, from an architectural perspective, is to encourage the architects to look at Saffron Hall, in Saffron Walden, as a case study for how the second (charity) venue might work. Built with an anonymous bequest, the hall seats over 700, so is a touch larger than the aimed-for 450 in Reading. But using an admittedly quick-and-dirty look on Google Maps (ensuring the scales are the same! ), I estimate it fits roughly the footprint of the administration building, so would be a useful case study to examine. It has attracted widespread praise for its acoustics and, importantly, this has enabled it to quickly build a reputation as somewhere world-class musicians want to and do perform. It is a great success story that we should seek to emulate. There is such a wealth of music-making in Reading to be accommodated by the new venues. I hope that my comments are helpful in adding musicians’ needs to those of theatre companies. It would be such a shame if an opportunity was missed by only focussing on the specific needs of theatre, at the expense of other performing arts. Please do let me know if I can contribute further to the discussion.